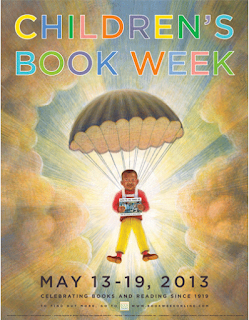 "Established in 1919, Children's Book Week is the longest-running national literacy initiative in the country. Every year, commemorative events are held nationwide at schools, libraries, bookstores, homes -- wherever young readers and books connect! Children's Book Week is administered by Every Child A Reader, a 501(c)(3) literacy organization dedicated to instilling a lifelong love of reading in children. The Children's Book Council, the national non-profit trade association for children's book publishers, is an anchor sponsor." Read more here and enjoy the week!